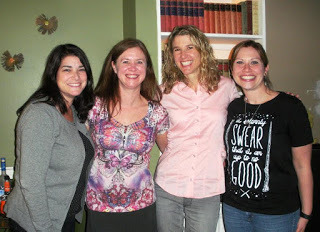 Remember how I met those amazing bloggers at BEA? And it was fantastic, because these ladies are seriously accomplished. Not only is her house beautiful, but it’s bookish as all heck. She has a for-real library with windows that look out into the treetops, and a cozy reading room with a fireplace, and she even has a Harry Potter themed bathroom. I’m not even kidding. Then we were talking with Marisa of The Daily Dosage about her new job, which she has been gearing up for during the past year. And she has one of those jobs that makes other work seem really easy, so we were all pretty much in awe of her. And then it came to light that Katie of Words with Worms not only gardens like a fiend (the woman’s flowers are ridiculously beautiful), but she also decorates 4 (yes, I said 4) Christmas trees at her house every year. And then she rapped some Hamilton and brought down the house. I was clearly out of my league (and also missed nearly every pop culture reference), but they were kind and pretended not to notice. We had a fantastically bookish and blogish conversation, and everyone’s TBR grew (I added Burial Rites and Forty Rooms and… oh my gosh, I thought that was it, but there’s more… Also: Aristotle and Dante Discover the Secrets of the Universe). And then Julie and I raved so much about A Gentleman in Moscow that Katie and Marisa said they’d read it (maybe so we’d hush). It was a delightful get-together. So, dear readers… Who are the people in your real-life world who talk books with you? You were NOT out of your league! Um, no, gorgeous, nice try. You were the only other Hamil-fiend in attendance and you got ALL my LMM gushing. Pop culture references my foot. We will definitely have to do it again soon because I simply adore all of you. It is really neat to get together with folks that one meets on social media. Julie — In addition to being the hostess with the mostest, you are very kind. So much fun hanging out with you ladies! Katie darlin', right back at ya. When it comes to Hamilton, we'll never be satisfied. Brian — Agreed! There are too few bookish conversations in everyday life. But wow, when they happen, it sure is thrilling. Thank goodness for book bloggers.